O'Sullivan is eliminated on Day 4 on Shanghai Masters after Judd Trump and Ding Junhui 's out in the previous round. Anthony Hamilton kept his on-fire form to beat Ronnie 5-3. Ronnie led 3-2 in the match with 92 and 65 but Hamilton proved himself was a better player later on. Hamilton took 4-3 led with 107, his fifth century in three matches that he played in. He finished the match 5-3 with 63 under pressure. Hamilton's solid break-building assisted him to capture this victory against the Rocket. He caught the mistakes and chances left by Ronnie which is not that easy. Hamilton said in the previous match with Maguire: "I've played great in both matches so far, I'm always a dark horse but if I keep playing like this then anything can happen." Hamilton can be the dark horse to win if his form continues. Hamilton faces Mark King in quarter-finals, who battled against Fergal O'Brien 5-3. Higgins is now facing Neil Robertson, who gets into quarter-finals of China ranking events for the first time. Robertson came through from a win over Michael Holt 5-2. Williams will play his fellow countryman as well as his best friend, Matthew Stevens in the next round. Stevens triumphed 5-1 over Martin Gould who edged out Ding Junhui yesterday from a comeback. 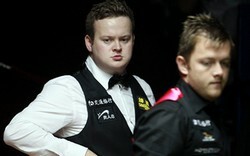 Shaun Murphy displayed another classy battle after first round's comeback against Dominic Dale. Murphy made 102 in the opening frame before going all square 2-2 during the mid session. Allen hits the balls well to lead 4-2 with 100, only one more frame to go to quarter-finals. The Magician performed his magic in the next frame, 143 which is the highest break of the tournament so far along with 77 to force a decider. Murphy locked his victory by 40+ to be though. Murphy sets up a clash with Mark Selby, a good friend of his in the quarter-finals. The Leicester-man whitewashed Jamie Cope with 114, 70 and 60.